My love affair with the Opal Apple continues. I personally love this amazing apple. These Opal apples are best known because they are resistant to browning, but their flavor is incredible. If you haven’t yet tried the Opal apples you are missing out on an amazing apple. You will soon be in love with these baked opal apples. This apple is resistant to browning. You can cut this apple open and leave it out, and it won’t brown. What does his mean to you? It means you can make that fruit salad without having to add lemon juice that may make it bitter. These apples are perfect to slice up and pack into a school lunch. These apples aren’t frankenfood, they are a type of apple that comes from two different types, the Topaz and the Golden Delicious. In fact, these apples are Non-GMO certified. I have used these apples in Apple Pie Tacos, Opal Apple Bread Pudding, and a Caramel Appletini. So you can see this apple is diverse. It tastes wonderful fresh, and it bakes up very well. These baked apples are an easy treat to make. These apples are hollowed out and a sweet and savory filling is placed inside. This is a great alternative to an apple pie. These apples are filled with honey, almonds, cinnamon, a touch of vanilla and more. This for a clean eating dessert that everyone will love. The Opal apple holds up well to baking. It remains nice and firm, and it serves up a healthy dessert you will love serving. 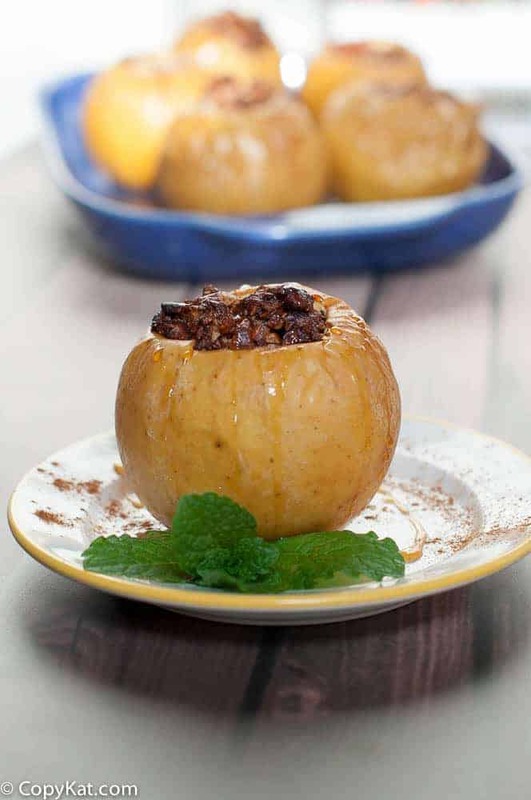 Baked apples are a wonderful fall treat, these are hollowed out and filled with cinnamon and nuts. Place almonds onto a baking sheet and toast in the oven while it is heating until they become fragrant. Remove almonds and chop into small pieces. Place almonds into a small bowl. Wash the apples well. Take a sharp knife and cut the stem out of the apple. Then use a melon baller to scope out the cavity of the apple. Remove a 1 1/2 inch core out of the apple, but do not cut through the apple completely. You may want to level the apple by checking to see if it will sit upright on its own. If it does not, trim enough off the bottom of the apple so it will sit upright. Prepare the filling by tossing together the chopped almonds, ground cinnamon, honey, salt, and vanilla extract. Add 2 tablespoons of melted butter to the filling. Place filling into the apples. Place about 1 teaspoon pat of butter on the top of each apple. Place boiling water and 2 tablespoons of butter into a 13 x 9 inch baking dish. Place apples into the baking dish. Bake apples for about 35 to 45 minutes. Baste apples about every 10 minutes while cooking. Apples will be done when they are firm, and give slightly when pressed. When serving spoon some about a tablespoon of basting liquid. You can drizzle with additional honey if desired. These are some of the most awesome apples.